We are happy to announce today that we have taken survey reporting to the next level by introducing the “Cross Tabulation” filter. Sharing your online survey with a wide variety of participants is a great way to get rich and informative data in your survey report. Although having all of the responses bundled together in the report provides a great overview, on many occasions it would be nice to focus on a specific group. 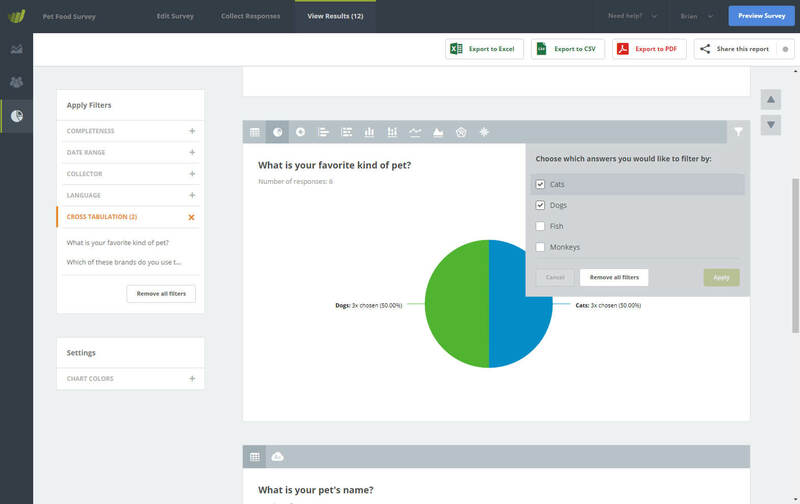 Now, with Cross Tabulation, you can filter your survey results based on answers provided by your participants. When the filter is set, all of the results in the report will be updated, showing you only data based on the responses from participants who answered what you have filtered. You can set “cross tab” filters on any closed question in your survey. For example, question “How old are you?” could have a filter set on “25 – 34”. You will then only see aggregated results – across your entire report – of participants who have answered the question with “25 – 34”. This was a popular feature request and we are delighted to be able to include it in the tool for you. Up until now, you could only filter by set date ranges, such as 7 days, 14 days, etc. We have just launched a new update which makes it now possible for you to specify any date range you need by using date pickers. This is great if you only want to show the responses from the past few days for example.